Augmented vs. artificial intelligence: What’s the difference? Movies like iRobot, Chappie, Ex Machina and, of course, the classic Terminator, all portray a future where artificial intelligence is a staple part of day-to-day life. But, the promise of this futuristic technology is only in its infancy in modern day society … or is it? We’re all aware of how powerful companies would become if they had such a technology in their hands, with its added benefits allowing them outpace the competition, get more business or raise more capital — it’s easy to see why everyone is claiming to have it. And with both the average person (and sometimes, even the more tech-savvy person) viewing the highly sophisticated software as the turning point to our intelligence-driven future, why wouldn’t it be called AI? There’s a catch — true artificial intelligence does not exist and will not exist for at least a decade, even though the AI industry is predicted to be worth nearly $3 billion this year alone. Because of this reality, it begs the question: If we aren’t currently experiencing true AI, then how can we categorize the current state of advanced algorithms and technology? The answer is simple. Right now, we’re living in the era of augmented intelligence. What exactly is augmented intelligence? From the surface, augmented intelligence looks nearly identical to artificial intelligence, but there is one major difference: There’s a person, like a programmer, pulling the strings behind the scenes in each and every possible scenario the AI program may need to act upon or telling the computer how it needs to learn. While machines using augmented intelligence can often act and react like humans, these actions are only based on human inputted information. In other words, and in very simplistic terms, a software developer inputs several “if this, then that” scenarios and creates a near-real-world reaction that a machine is able to act upon. Even when using advanced machine learning, a developer is inputting the logic of learning and the reasoning behind it. The key factor that makes this intelligence augmented is the ongoing manual intervention which dictates how, if and when a machine reacts. What qualifies as artificial intelligence? Artificial intelligence can be defined as the creation of a machine that can replace and perform tasks that normally require human intelligence and reasoning. Robots today can replace many human tasks, however, the most critical pieces that define true artificial intelligence are the main traits that create human reasoning or logic (beyond knowledge): morals and ethics. First, an artificially intelligent machine should have morals, meaning it must be able to define for itself right from wrong within the context of its situation, position, place in the world and more. For example, if an autonomous vehicle is tasked with a scenario where it must put either one or multiple lives at risk, it must be able to make a decision in the blink of an eye. This decision, which takes multiple real-time elements and considerations into account, includes “living” (or not) with the consequence of that very decision. Next, this technology must have its own set of ethics that governs its behavior and learns from its experiences. Principles, that while guided, are self-imposed and self-governed. For example, if a search-and-rescue drone can fulfill a non-life-threatening but critical job while imposing on someone else’s privacy or property, should it do so? And should there be consequences if the drone breaches privacy but no one knows? While logic, in its most basic state, can be programmed into a machine (i.e., if this happens, then this is the appropriate response), true logic is deeply rooted in both morals and ethics that drive the machine — no pun intended— and are learned and instilled in each human throughout their lifetime, backed by generations that came before them and thousands of years of culture. In order for authentic artificial intelligence to take form, machines or bots powered by this revolutionary technology will need to meet these qualifiers to start “thinking” for themselves to match basic human instinct and reasoning. In fact, true artificial intelligence means the machine can change its morals and ethics with time and experience, and perhaps even act against them if the situation calls for it. And if this indeed becomes reality, where machines can act like humans and work against their own preprogrammed ethics, any attempt to limit its behavior or outcome will be futile. Now, when will we reach the era of true artificial intelligence? Despite its newfound reputation as the industry golden child, there has still been no instance of true artificial intelligence. While augmented intelligence has masked itself as artificial intelligence in a few instances, like when it was reported Facebook decided to shut down its experimental AI bots because they had created their own language, there was always a “Great and Powerful Oz” figure behind the machine. This speculation and vision of a futuristic world, where artificial bots think for themselves and live among us in everyday, is likely quite some time away, so don’t expect to see Chappie walking down the street anytime soon. Moreover, when it happens, do we really think we will be able to control it? In 2017, technological advancements and the rise of next-generation services have laid the foundation in our way to paving a future full of smart cities. But to ensure this future becomes a reality, adoption of these systematic and efficiency-boosting technologies will need to expand. From drones and delivery bots becoming a reality to the thriving on-demand economy, our society is starting to lean in this direction – with several industry behemoths making strides towards our futuristic vision – but will start to pick up speed in the coming year. Residents who live in urban areas were 54 percent of the global population in 2014, and this number is expected to increase nearly two percent each year through 2020 (United Nations). In order to accommodate this growth, our cities will need to address traffic issues, new forms of delivery, more efficient services among other direct results of rapid growth. Now, how will our infrastructure support this expansion? These next-gen technologies stand as the only feasible way to make our cities even more ‘smart’. From drones and delivery bots becoming a reality, to the demise of traditional retail as people know it and the on-demand economy thriving – new consumer preferences are largely dictating what businesses and people will continue to see in 2018 and beyond. While urban residents account for 54% of the global population in 2014, this is expected to increase nearly 2% each year through 2020 – meaning cities are challenged to address traffic issues, new forms of delivery, jobs, etc. In the trend towards the urbanisation of cities, technology stands as the only feasible way to make cities even more smart in 2018 and beyond. In acknowledgment of these changes, BoldIQ, an optimisation software company building the backend framework for an IoT/smart cities-driven future, has presented what it think will drive smart cities getting smarter in 2018. It’s safe to say 2017 was Amazon’s year with its $13.7 billion acquisition of Whole Foods Market and plans to use futuristic technologies like drones and bots for everyday deliveries. Such great success has created a new competitive marketplace with competitors like Walmart and Target now one-upping each other or racing to meet the new consumer expectations of free and/or two-day delivery. In response, this year Amazon will quickly need to find a way to differentiate themselves from the pack and offer something no one else currently does (or can) to regain their place at the top of the leaderboard in the New Year. As online sales surpass in-store sales each holiday shopping season, people will begin to see trial blazing retailers offer their customers the ability to purchase items any time of the year when the price is right for them – but ship It only when required during the holidays. Essentially offering the opposite of two-day shipping, with the retailer providing the consumer with warehousing versus a holding facility somewhere across the US. For retailers, this new approach provides a higher likelihood of purchase, increased consumer loyalty, and better predictability for deliveries during peak seasons. On the consumer side, this provides a more opportunistic shopping experience without the worry and hassle of finding somewhere to store the items before the big day. This year, retailers will begin to implement a ‘buy and hold’ style purchasing option that can be applicable for anything from holiday shopping to future birthdays. Who knows, Amazon might even get creative on this front as one way to differentiate their services. Shopping malls and large retailers across America have been closing their doors over the past five years, leaving eerie vacant buildings ready for the next tenant to come in and transform it back to its newfound potential. And this will continue to happen into the New Year and beyond – except with a small twist. While the traditional brick-and-mortar store is starting to become a vision of the past, the use for these locations will switch to inventory retail stores. Think of how you shop online browsing through a retail showcase, but in-person. As e-commerce stores become the new norm, these retail fronts will provide shoppers the same experience of going to the mall – allowing them to touch, feel, or try on anything in the store – and purchasing. But instead of taking home the item on the spot, consumers will have their items shipped directly to their doorstep. No more carrying bags and boxes around. No need to take a car to do shopping. But keep the shopping experience. Between recent discussions by the FAA and White House to build ‘smarter’ cities, drones and bots may be coming to your doorstep sooner than you think. While countries like Switzerland and Rwanda have already jumped on the drone delivery bandwagon incorporating networks of drones into several industries like healthcare, the US is starting to fall behind. In the coming year, expect to see more companies testing both delivery bots in metro cities that are more heavily populated and drones in rural areas which has less “distractions” when delivering. Backed by the added convenience for every consumer, who could deny incorporating ‘smart’ technologies into our daily lives? On-demand services, which are the foundation of the gig-economy, include anything from ride sharing to food delivery or laundry services, have become an everyday convenience within our society. However, one aspect far overlooked is that companies in this industry are tapping into the same resources. Just think: every city taps the same pool of drivers for Uber and Lyft and the delivery people for GrubHub and Bite utilise both services to attain more jobs in one day. As more on-demand services enter the scene, the resource pool which they can tap into stays the same – showing that the bubble is sure to collapse at any point if on-demand services don’t consolidate via M&A or dissolve all together. In 2018, there will be the consolidation of companies within each vertical market – those that use their resources better, and offer superior customer service have the most to gain, while others can expect to become obsolete. With an unprecedented number of natural disasters this year, many companies will begin to overhaul their disaster recovery strategy and use smart technologies to optimise recovery efforts. By using software that provides decisions based off of previous disaster data, companies will start to turn away from the ‘war room’ and rely on advanced technology to make life saving decisions in real-time. In addition to using ‘smart’ technologies, states, organisations and individuals will turn towards applications that crowdsource recovery efforts to formulate the best plan when they are forced to expect the unexpected. BoldIQ team helps raise $1.1M! Thursday morning, nearly 1,000 industry and community leaders came together at the OpportunityTalks breakfast to become Hit Makers for the next generation of STEM and Healthcare leaders. This great annual event was arranged by The Washington State Opportunity Scholarship. 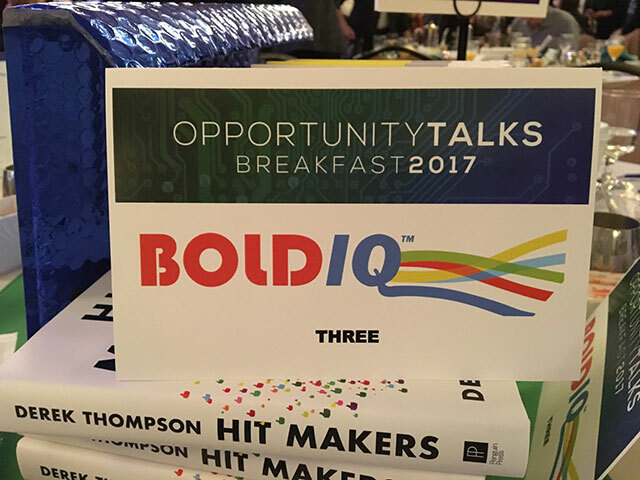 The BoldIQ team is proud to have filled three tables of participants at the breakfast. Together, we raised $1.1M for student scholarships! This invigorating morning program featured keynote speaker Derek Thompson, author of Hit Makers: The Science of Popularity in an Age of Distraction. But even more inspiring were the phenomenal young students, the WSOS scholars, that we got to interact with. 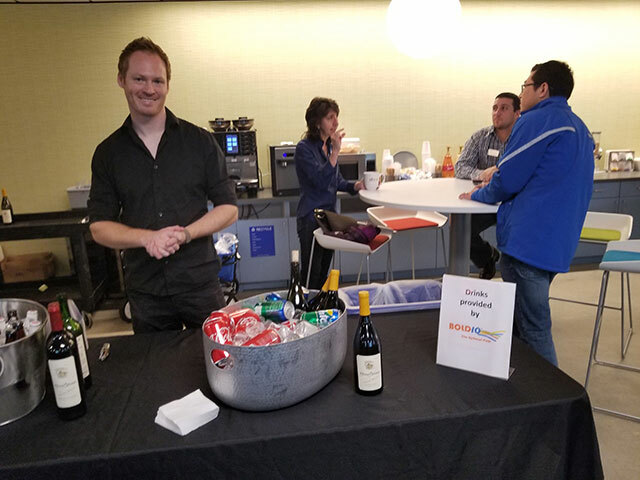 Last night, Nov 3rd, BoldIQ was a proud sponsor of the New Tech Eastside event focusing on diversity in tech companies. Great conversations around the topic.